Eight patients were recruited in the study. The demographic, clinical characteristics, and biochemical investigations are summarized in [Table 1]. Imaging could demonstrate focal/segmental Ga-68 DOTA-exendin-4 uptake with mean maximal standardized uptake value (SUVmax) of 21 ± 5 (SUVmax: 25) [Figure 1]a and [Figure 1]b in three of eight patients as shown in [Table 2]. The corresponding CT images demonstrated arterial enhancing lesions. Other five patients did not show any Ga-68 DOTA-exendin-4 uptake higher than background. Six patients underwent laparotomy. 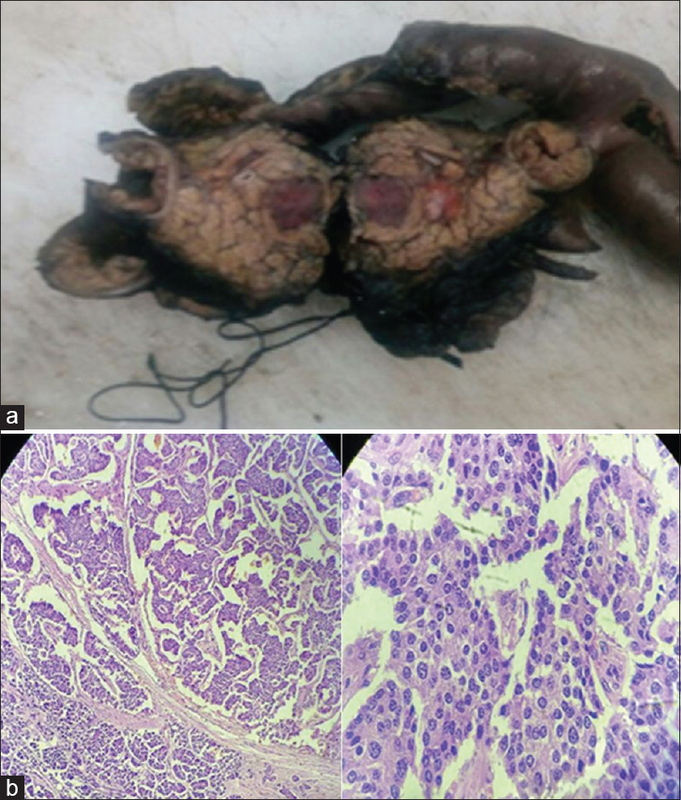 Three patients with positive scan results were proven as insulinoma on histopathological examination [Figure 2]a and [Figure 2]b. These patients were free of hypoglycemia symptoms in the postoperative period. Figure 2: (a) The image showing surgically removed gross specimen. Placzkowski KA, Vella A, Thompson GB, Grant CS, Reading CC, Charboneau JW, et al. Secular trends in the presentation and management of functioning insulinoma at the mayo clinic, 1987-2007. J Clin Endocrinol Metab 2009;94:1069-73.
de Herder WW, Niederle B, Scoazec JY, Pauwels S, Kloppel G, Falconi M, et al. Well-differentiated pancreatic tumor/carcinoma: Insulinoma. Neuroendocrinology 2006;84:183-8. Guettier JM, Kam A, Chang R, Skarulis MC, Cochran C, Alexander HR, et al. Localization of insulinomas to regions of the pancreas by intraarterial calcium stimulation: The NIH experience. J Clin Endocrinol Metab 2009;94:1074-80. McLean A. Endoscopic ultrasound in the detection of pancreatic islet cell tumours. Cancer Imaging 2004;4:84-91. Reubi JC, Waser B. Concomitant expression of several peptide receptors in neuroendocrine tumours: Molecular basis for in vivo multireceptor tumour targeting. Eur J Nucl Med Mol Imaging 2003;30:781-93. Körner M, Christ E, Wild D, Reubi JC. Glucagon-like peptide-1 receptor overexpression in cancer and its impact on clinical applications. Front Endocrinol (Lausanne) 2012;3:158. Christ E, Wild D, Ederer S, Béhé M, Nicolas G, Caplin ME, et al. Glucagon-like peptide-1 receptor imaging for the localisation of insulinomas: A prospective multicentre imaging study. Lancet Diabetes Endocrinol 2013;1:115-22. Sowa-Staszczak A, Pach D, Mikołajczak R, Mäcke H, Jabrocka-Hybel A, Stefańska A, et al. Glucagon-like peptide-1 receptor imaging with [Lys40(Ahx-HYNIC- 99mTc/EDDA) NH2]-exendin-4 for the detection of insulinoma. Eur J Nucl Med Mol Imaging 2013;40:524-31. Christ E, Wild D, Forrer F, Brändle M, Sahli R, Clerici T, et al. Glucagon-like peptide-1 receptor imaging for localization of insulinomas. J Clin Endocrinol Metab 2009;94:4398-405. Antwi K, Fani M, Nicolas G, Rottenburger C, Heye T, Reubi JC, et al. Localization of hidden insulinomas with 68 Ga-DOTA-exendin-4 PET/CT: A pilot study. J Nucl Med 2015;56:1075-8. Ehehalt F, Saeger HD, Schmidt CM, Grützmann R. Neuroendocrine tumors of the pancreas. Oncologist 2009;14:456-67. Wild D, Mäcke H, Christ E, Gloor B, Reubi JC. Glucagon-like peptide 1-receptor scans to localize occult insulinomas. N Engl J Med 2008;359:766-8. Christ E, Wild D, Antwi K, Waser B, Fani M, Schwanda S, et al. Preoperative localization of adult nesidioblastosis using 68 Ga-DOTA-exendin-4-PET/CT. Endocrine 2015;50:821-3. Luo Y, Pan Q, Yao S, Yu M, Wu W, Xue H, et al. 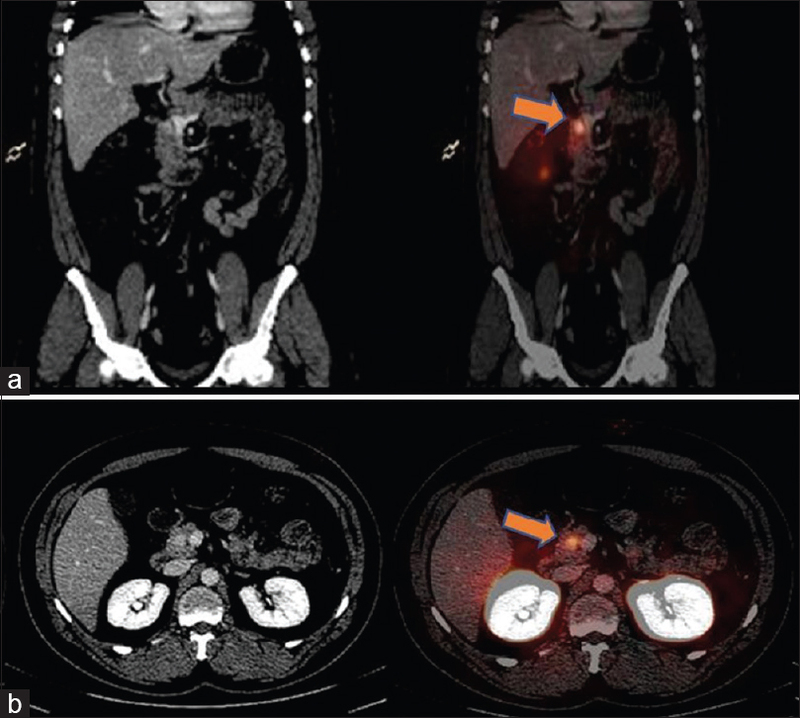 Glucagon-like peptide-1 receptor PET/CT with 68Ga-NOTA-exendin-4 for detecting localized insulinoma: A prospective cohort study. J Nucl Med 2016;57:715-20.